‘Primordial Scream, Eternal Smile’ is an Urban sound and sculpture installation about evolution and the invincibility of adaptation, the fittest to change. 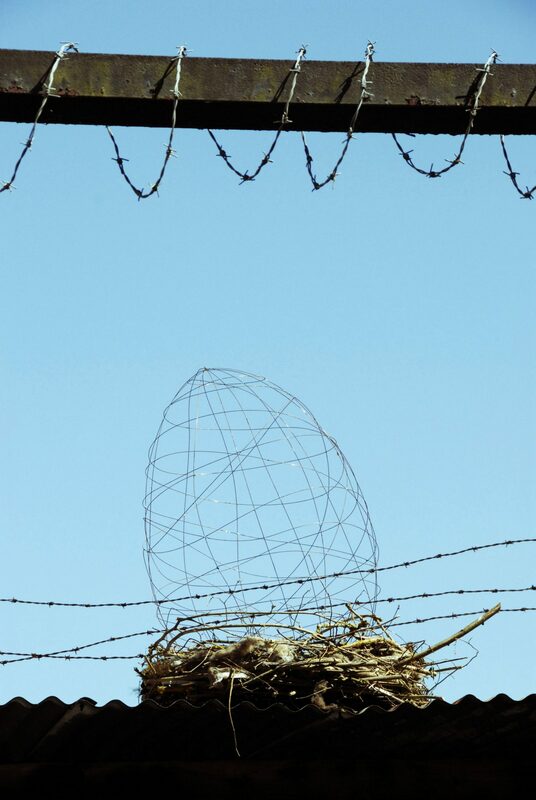 I have always admired the ingenuity and inventiveness of urban birds nest building such as Collar Doves for example that are able to construct a nest with the most improbable materials in the most challenging civic architecture made of its sharp erected materials and waste reality. ‘Primordial Scream, Eternal Smile’ is an Egg made of Copper wire soldered together, resting on an urban nest made of Dust and Hair soil and plastic and threads and cups and detritus and city-remains/materials I collected from the streets’ corner and Market Square of Warwick Town mixed with woven little tree branches and mud I gathered from the nearby Hampton Woods. Together with music artist James Bradell (Fanki-Porcini, Ninja Tunes) we composed a three hours sound collection of varied bird’s choruses played from the roof top of 64 Market Place, for a very small duration of 10 seconds at intervals of 5/7 or 3 minutes of silence followed by a different bird sound like a blue-titt -silence a duck, silence a Woodpecker metronome calling, a starling murmuration, silence, space and so on. Many visitors or simply town-passersby noticed parts of the Iron Yard they had never noticed before, it created an unexpected connection to parts of their own town such as the barber fence next to the 17′ Century Iron bracket by the window of the then iron monger workshop up a spiral stairs now become an outstanding printing workshop. Belonging, Gaze, Unexpected Stimulus, Gaze Direction, Engagement, Curiosity, Primordial, Eternal, Civic Visibility, who owns the Landscape? Who decides what we see and sense.